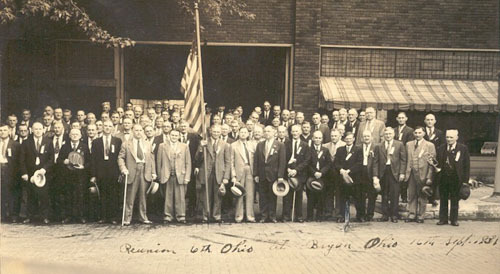 A Reunion of the 6th Ohio Volunteer Infantry in Bryan, Ohio in 1931. In the first row, fifth from the right is William Milford Prosser, musician of Company M.
Below is a roster of the 6th Ohio Volunteer Infantry. Captain Edward W. Rydman, q.m. to accept commission as Capt, Co I. 1st Lieut. Daniel C. Draper, batt. adj. 2nd Lieut. James E. Melville Milne, batt. adj. Regimental Sergeant Major Frederick M. Bamgardner, promoted to batt. adj. Hospital Steward Edward J. Speice to h.c.
2nd Lieut. Frederick M. Baumgardner, batt. adj. Private Burt G. Chollett to h.c. Private Frank W. Johnson to h.c. Private Wiley DeBarr Hickey to h.c.
1st Sergeant Benjamin C. Rude to accept com. as 2nd Lieut., Co G.
Private Frank J. Koegle to h.c. Private Fred Schneerer to h.c. Private Clarence F. Ward to h.c. Private Harry S. Shepler to s.c.
2nd Lieut. Arthur D. Hill, 16 Jan 1899 to m.o. Private Daniel C. Moor to h.c. Private Arthur D. Newman to h.c. Private George J. Monk, to h.c.
Corporal Cornelius Callahan to s.c.
Corporal Jacob T. Lehnertz to s.c.
2nd Lieut. Alvin I. Robinson, 16 Jan 1899 to m.o. Private Charles G. Cunningham to h.c. Private Edward A. Bricke to h.c. Private Henry Waggoner to h.c.
Wagoner Eugene J. Lancaster to h.c.
1st Lieut. James W. Frankfather, 29 Oct 1898 to m.o. Private Fred E. Frehse to s.c. Private Austin J. Smith to s.c. Sergeant Ross E. Parker to s.c.
Corporal Joseph W. Russell to s.c. Private Elmer E. Yates to Co H, 6th OVI. 2nd Lieut. Homer W. Loomis, 9 Nov 1898 to m.o. 2nd Lieut. James W. Frankfather promoted 1st Lieut. and transferred to Co E.
Private Armitage J. Green to h.c. Private Archie J. Holmes to h.c. Private Harley W. Hughes to h.c.
1st Lieut. George W. Cunningham, 1 Nov 1898 to m.o. 2nd Lieut. Benjamin C. Rude, 1 Sep 1898 to m.o. Private Oscar T. D. Brant to h.c. Private Marion Bolles to h.c. Private Fred L. Croninger to h.c. Private Earl Zoll to s.c.
2nd Lieut. William H. Duffy, 15 Oct 1898 to m.o. Private John J. Conmay to h.c. Private Mark Knabenshue to h.c. Private Carl C. Knights to h.c. Private John H. Spaulding to h.c. Private Charles F. Link, Jr.
Captain Edward W. Rydman, 16 May 1898 to m.o. 2nd Lieut. William E. Lyons, 1 Sep 1898 to m.o. Private Reuben W. Hess Jr. Private Llewellyn E. Champion to h.c. Private Fred E. Lony to h.c.
Musician Harkness J. Miller to h.c. Private Harry F. Ashley to s.c. Private Richard N. Holding to s.c.
Captain Myron C. Cox, 9 Sep 1898 to m.o. 1st Lieut. Frank L. Matthews, 26 Sep 1898 to m.o. Private Fred L. Albriton to h.c. Private Fred Bower to h.c. Private Arthur E. Faust to h.c.
Musician Edward H. Heider to band. Private William H. Emery to h.c. Private Daniel W. Iford to h.c. Private Henry J. Johnston to h.c.
1st Lieut. Edward Welsh, 2 Sep 1898 to m.o. Private Norton R. Travers to h.c.
Pratt, E. Warren, Official History of the Ohio National Guard and Ohio Volunteers: The United States Volunteers in 1898-99, including a History of each Local Organization and each Regimental Formation from its Inception to the Present Time. (Cleveland, Ohio: The Plain Dealer Publishing Co., 1901).